Skills test consists of five minutes of dictation at 180 words per minute. The test candidate closes the realtime file at the end of the dictation and turns in an unedited file for scoring. 96% accuracy must be achieved in order to pass the examination. Registered Merit Reporter – NCRA (RMR), an advanced certification, including written knowledge exam. The three test legs are given at speeds of 200-260 words per minute with 95% or higher accuracy. Registered Diplomate Reporter—NCRA (RDR), a written knowledge exam that is the high-level achievement exam. Registered Professional Reporter – NCRA (RPR), the basic national court reporting certification, which includes a written knowledge exam, given at speeds of 180-225 words per minute. Oregon Award of Excellence (OCRA), a skills-only test. The three test legs are given at speeds of 210-270 words per minute with 95% or higher accuracy. 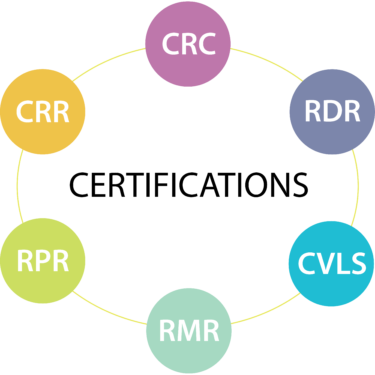 Certified Realtime Reporter – NCRA (CRR), a basic realtime skills test with the same written knowledge test as the RPR test. The test is given at a speed of 180 words per minute with 96% or higher accuracy. To read more about captioner certifications, visit NCRA’s Certifications page.